This enclosure leaves the corner quite open. Wouldn't the 3-3 invasion be successful here? xela: Depends on your definition of "successful". It would live, but black would seal it in and make a lot of influence. apt1002: 4-2 is a good answer to 3-3. White may be able to play at (as slide or submarine). 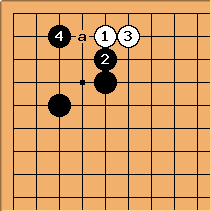 Then this sequence is standard, being correct shape (at a leaves bad aji). 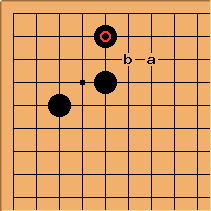 There are various ways to enclose the corner more securely: was an idea of Kubouchi Shuchi. Black a is common but Black b is probably most popular from the point of view of corner safety. This isn't often seen in pro games. 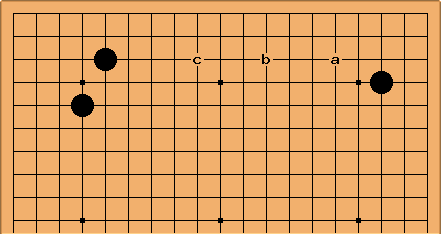 White a, Black b is a continuation seen in a couple of examples.